The Scalibor Protectorband Collar should be replaced after 6 months to maintain continuous protection. Below are some recent questions we've received regarding Scalibor Protectorband Collar for Dogs, including answers from our team. These two products have very different ingredients, so they can be used together. Scalibor is better in some ways because it has a repellent action. Nexgard is effective after a parasite (eg tick) has taken a blood meal and disease transmission is therefore possible before the parasite has been killed. Using both together is indeed likely to increase the efficacy of parasite treatment. What size collar do they need? Hi- I have two dogs with 18" necks who weigh around 16-18KG. Which size should I go for? I Am travelling to Spain and Portugal in December until April or May next year. Is your collar required/nessecary as I believe its not really mosquito / sand flies season. If you recommend yes... would I also need to put a flea collar /use Spot on as well? Or does your one do everything. Depending on the area you are in, the winter is indeed a very low risk period. However the Spring is high risk for ticks so I would recommend using the collar for the duration of your trip. It is best to use a spot-on for fleas at the same time too. The ingredient in Scalibor is not toxic to humans in the levels they are present in these collars, though some people are potentially more sensitive to it than others. At very high doses it is dangerous to people but that cannot occur from these collars. Having said that it makes sense to minimise or eliminate any human contact with it. Children obviously should be protected if possible. Anybody who has regular contact over a period of time can develop a greater sensitivity to it. You have identified the biggest concerns and you should try to be sensible about things, though not paranoid about them. Young children should not have direct contact with a collar, especially if recently applied. They should also not have prolonged close contact with a dog wearing the collar, such as sleeping with the dog. The active ingredient can be absorbed through the skin to some extent. If you use the collar, reducing direct contact, especially for children, is just sensible. The usual advice is to avoid any swimming at all for the first 5 days after the collar has been applied. After that, it is OK to remove the collar while swimming etc, and re-apply the collar as soon as the dog has mostly dried off. I am taking five working cockers to Portugal. They are all mad on swimming and I would like to know how effective these collars are if they get wet ? I am taking my dog to America and central America for over a year and suspect I shall be prescribed a heart-worm effective spot on treatment, such as Advocate, to prevent the infestation of lice/ticks/worms etc. 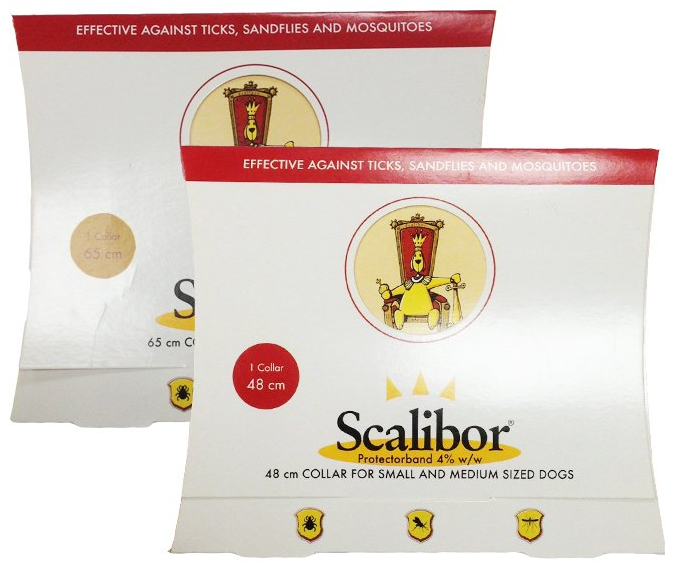 Would you also advise using something like Scalibor Protectorband Collar, to deter any mosquitos as well? I am aware that heart-worm is rare, and rarely even fatal and also that these anti heart-worm medicines are fairly potent chemicals - as such I do not want to over dose my dog, causing more long term harm than good. Would you advise I take something more topical like garlic water to deter mosquitos? Many dogs which travel to these areas do in fact die of heartworm, Leishmaniasis, Babesiosis etc. I would certailnly recommend using a Scalibor collar and also Advocate or an equivalent. It is true that there are fairly potent chemicals in these products and side effects can happen, though they are rare. However the chances of a non-native dog picking up a serious infection are higher (though not 100%). If I were you, I would use the products. Use with other spot on's ? is it safe to use if the dog also uses Advocate for worming? The active ingredients of these 2 products should not interact and we would expect it to be safe to use both products together.